CNG, LNG and LPG Certifications: Assurance for Manufacturers and Consumers. 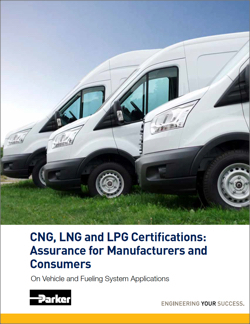 In this white paper, you'll learn about the importance of testing and validation, descriptions and contact information for organizations that provide certifications for natural gas vehicles and dispensing stations, the types of certifications for on vehicle and fueling station products, types of extreme condition tests, and information on CNG inspector training and certification programs. Complete the brief form below and you will receive an email with a link to the white paper.